SAN DIEGO, California, October 9, 2013 (ENS) – The first public EV charging station in the United States that supports all models of electric vehicles has opened in San Diego. It can charge the batteries of cars that operate on any of the three existing connection systems. Located at the Fashion Valley Mall, the charging station features both SAE Combo and CHAdeMO direct current (DC) fast charge connectors. Both are direct-current quick-charging systems designed to charge an EV’s battery to 80 percent in about 20 minutes. The charging station also offers traditional alternating current (AC) J1772 Level 2 electric vehicle charging to serve electric vehicles that do not have a fast charging option. Drivers of Nissan’s LEAF or Mitsubishi’s iMev can use only the Japanese-developed CHAdeMO standard chargers. Seven other automakers – Audi, BMW, Daimler, Ford, General Motors, Porsche and Volkswagen – had agreed to introduce the SAE Combo Combined Charging System in mid-2012. 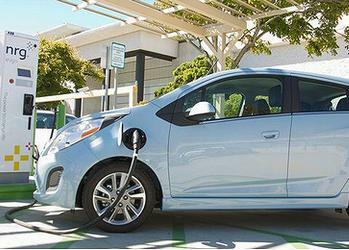 The Chevrolet Spark EV, released this past summer, and the BMW i3 will use the SAE Combo plug. The combination plug is intended to unify the design of electric cars by using a single charge port and the same basic communications protocols for both Level 2 and DC fast charging. The new charging station, called a Freedom Station, was introduced by NRG eVgo (say ee-vee-go), the EV charging subsidiary of power company NRG Energy, Inc., and the Simon Property Group, Inc., which offers shoppers electric vehicle charging stations at 43 of its malls across the United States. “California accounts for one-third of all electric vehicle sales in the US. The NRG eVgo Freedom Station at Fashion Valley gives California drivers freedom to go anywhere they want in the coolest cars on the road and at lower prices than gasoline cars,” said Terry O’Day, Vice President of Business Development for NRG eVgo in California. “With charging options at your home, apartments and work combined with on-the-go charging, our mission is to make it even easier to choose to drive an electric car,” said O’Day. The unveiling of the charging station at the region’s largest shopping destination supports the state of California’s goal of 1.5 million zero-emission vehicles on roadways by 2025. “Announcing our first NRG eVgo Freedom Station site at Fashion Valley Mall reinforces our commitment to sustainability while also providing shoppers with unparalleled service and convenience,” said George Caraghiaur, senior vice president of sustainability, Simon Property Group. Available 24/7, the combined charging station is placed near retail stores and restaurants to allow drivers the option to shop or eat while charging.